Posted on February 4, 2017 Posted in Cakes, Jamaican, Traditional	. 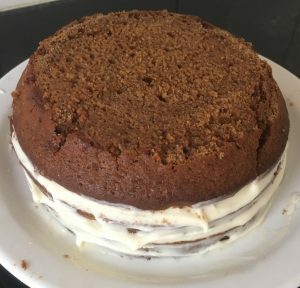 It’s not so much the cake that is the traditional element here (though ginger cake is a common cake to eat in Jamaica where many brand specialize in this treat).It’s the Jamaica Ginger extract, known in the US by the slang name “Jake,” that makes this traditional. This ginger is world renown for more reasons than one. Most interestingly is the background of the ginger extract, in the 1900th century the US Treasury Dept. had prohibition laws on the ginger as it is so high (excuse the pun) in ethanol. When chemists attempted to counteract the high ethanol it actually resulted in a type of paralysis causing worldwide illnesses. Of course the Jamaican ginger is 100% safe to eat now and needless to say the culprits were dealt with. Preheat the oven to 180c degrees and line a 30cm cake tin with baking paper. 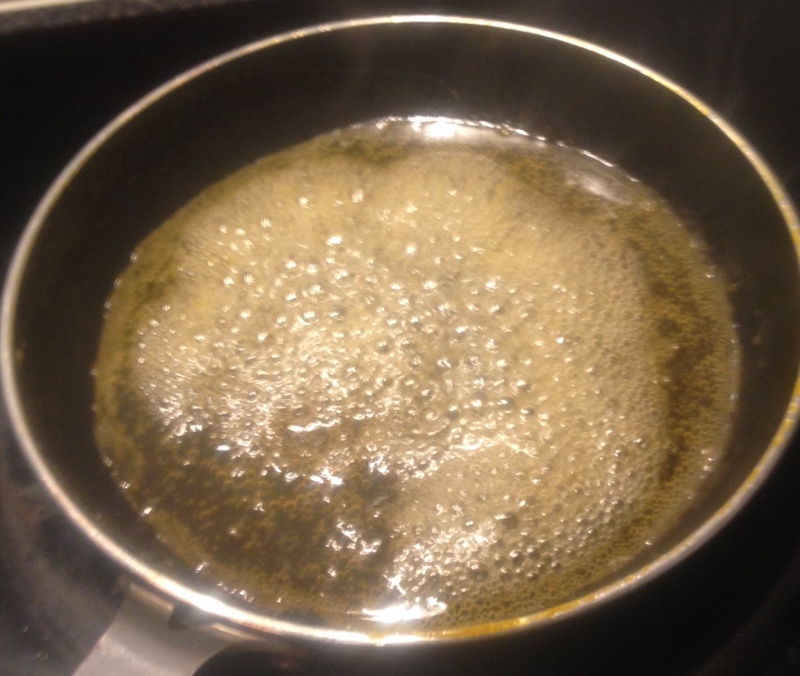 Place the butter, water, treacle, golden syrup and the sugar in a saucepan on a medium heat. 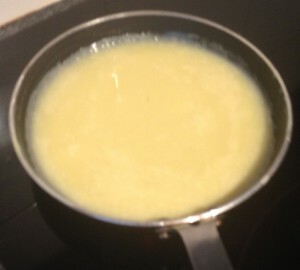 Stir continuously until the mix is well combine, butter is melted and sugar dissolved. Take the pan off the stove and leave to cool. Sieve the flour, salt and spices into a bowl. 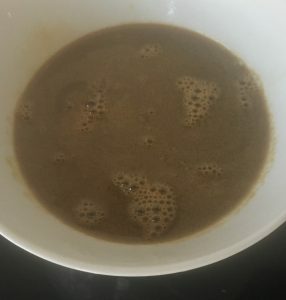 Stir the dry mix until well combined. Add the eggs to the butter mix, one at a time beating with electric beaters in each addition. 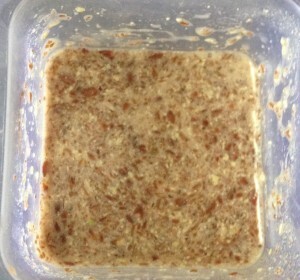 Add the milk and grated ginger and beat until combine. Add the dry mix to the egg mix and fold with a spatula until just combine. Pour the batter into the prepared tin and bake for 50 minutes or until a skewer inserted in the middle comes out clean. 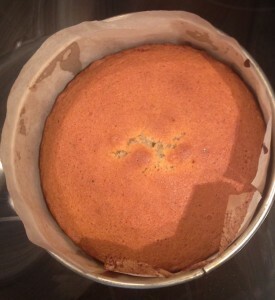 Leave the cake in the tin for 5 minutes then invert onto a cooling rack until cool. Meanwhile make the syrup by placing the ingredients into a saucepan and stir on a high heat for 5 minutes or until the mix becomes syrupy in texture. Remove off the heat and leave aside to cool. To make the cream beat all the ingredients together with electric beaters until firm peaks form. Place the cream in the fridge until ready to use. Then the cake is cooled cut horizontally into 3 layers. Place the layers on the bench and brush each on the cut side up with the ginger syrup. Place the bottom layer cut side up on a plate, top with ¼ of the cream. 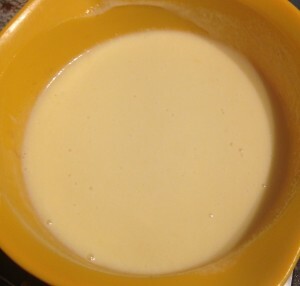 Place the 2nd layer syrup side up on top of the cream and top with another ¼ of the cream. Place the remaining cake layer cut side down onto the cream. With the remaining cream spread on the top and sides of the cake generously. 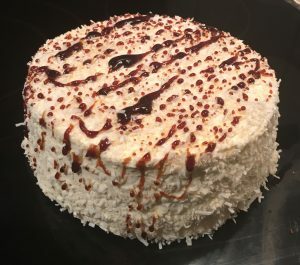 Sprinkle the coconut flakes on the top and sides of the cake to decorate. 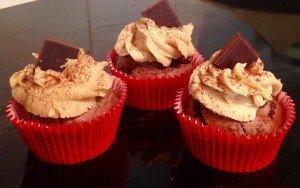 To finish you can decorate with a drizzle of extra treacle and serve. Tags: cake, gingerbread, jamaican, Jamaican Black Gingerbread Frosted Cake, lack gingerbread	. Posted on January 24, 2016 Posted in Cakes	. I have a friend who is converting from a vegetarian to a vegan and she is heavily interested in vegan cooking. 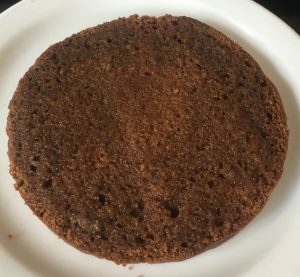 After a few conversations around vegan food and deciding we would spend a day experimenting I got excited to have my own baking experiment and make her a cake. 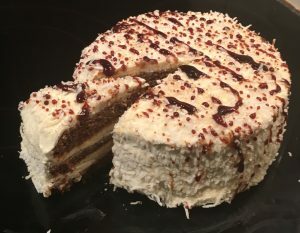 I do actually have a vegan cake on my blog that I have previously created (see Vegan Chocolate Cake), a nut dense cake, however I wanted to make a cost effective and easy recipe for anyone to be able to make. To add my unusual spin on things I ended up basing the cake on black beans to ensure a sturdy and moist cake, used seeds to mimic eggs and avocado to substitute cream. The outcome is a healthy vegan friendly moreish cake that was gone in minutes of hitting the table. 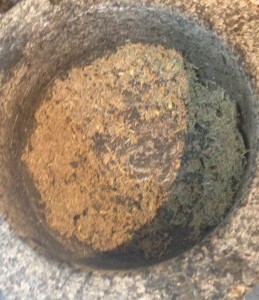 Grind the flaxseeds in a mortar and pestle until it resembles a sand like consistency. Add the 3 tbsn of water and stir. Leave aside to gel. 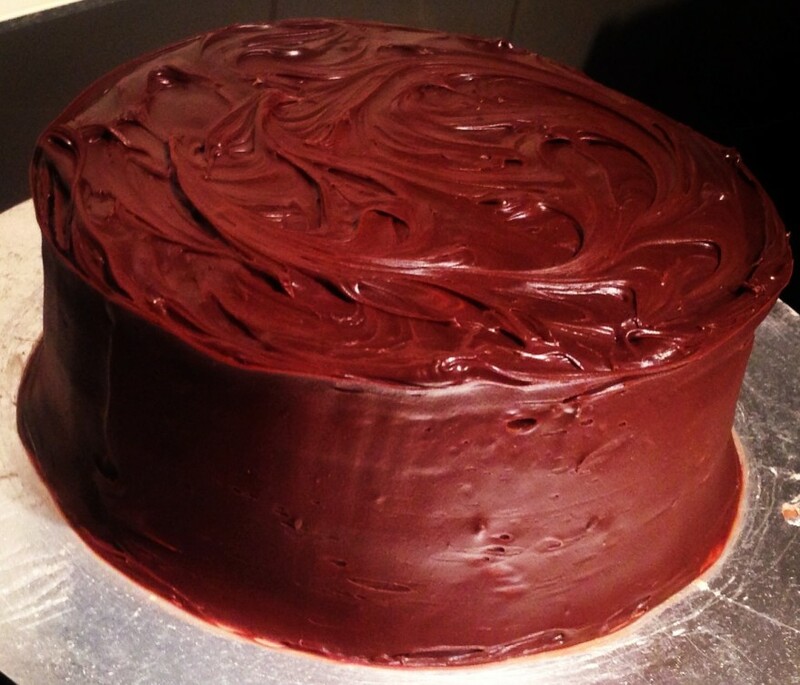 Pre-heat the oven to 180 c degrees and line a 25cm cake tin with baking paper. 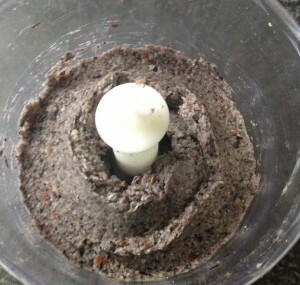 Rinse the cooked black beans and place in a food processor with the 70ml of water, blitz until pureed and smooth. Add the sugar, flaxseed mix and oil to the bean mix. Blitz until smooth and silky. 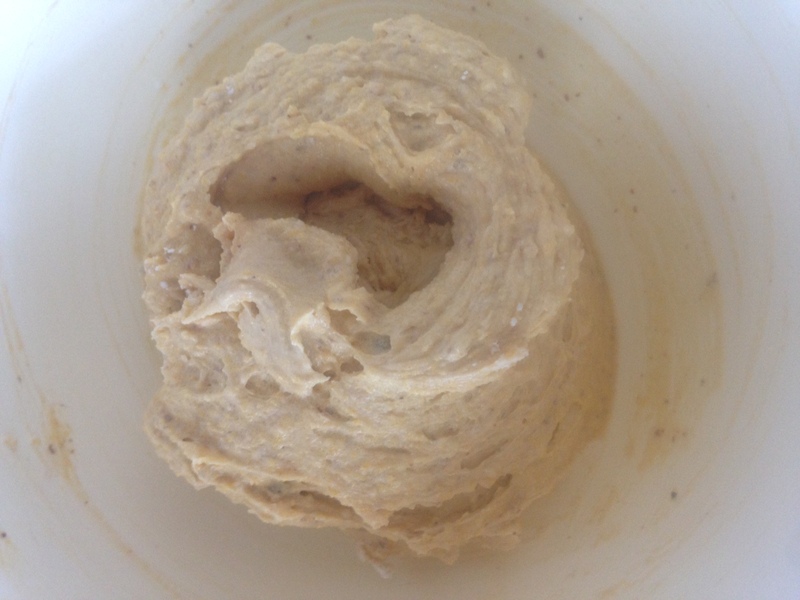 Pour the mix into a bowl and add the flour, cocoa powder, baking powder and bicarb. Using a hand whisk beat until the mix is combine and silky. Pour the mix into the cake tin and flatten the top with the back of a spoon and bake for 45 minutes or until a skewer inserted in the center comes out clean. Place the cake on a cooling rack until cold. 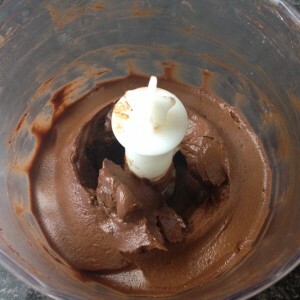 To make the frosting place the maple syrup, avo and cocoa powder into the food processor and blitz until silky sooth. Cut the cooled cake in half horizontally. Using a spatula spread half the frosting on the bottom cake layer and top with the second layer. Using the remaining frosting to ice the top and sides of the cake. If you would like to make cupcakes instead of a cake you can pour the mix into cupcake patties and bake for 20 minutes or until a skewer inserted into the center comes out clean. 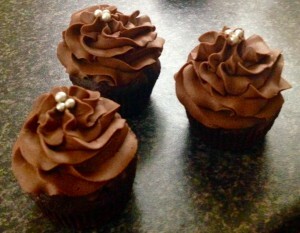 You can then use a piping bag and star nozzle to pipe the icing. 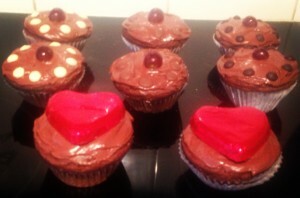 Tags: avocado, avocado icing, black bean, cake, chocolate, vegan, Vegan Black Bean and Chocolate Cake with Avocado Frosting	. Posted on December 27, 2015 Posted in Cakes	. For a few weeks now I have been experimenting with Limoncello in recipes, where though outcomes have been tasty they are not the amazing outcome I have been looking for. 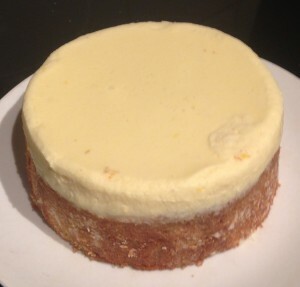 I realized that Limoncello as the sole hero ingredient was producing cakes that were not really special. To tackle this I looked at pairing the Limoncello up with flavors that tend to go well with Lemon but weren’t too sweet (as Limoncello is a lot sweeter than Lemons). After playing around with Limoncello & Almond, Limoncello & Blueberry and Limoncello & Lavender it was the latter pairing that made the best flavor combination. To allow for the strongest Limoncello flavor I decided on a mousse to hero the liquor as I could have a heavy hand and would not jeopardize the texture of the cake. As ground lavender will have limited effect on the cakes texture I opted for my never fail plain vanilla cake recipe with the inclusion of the lavender. 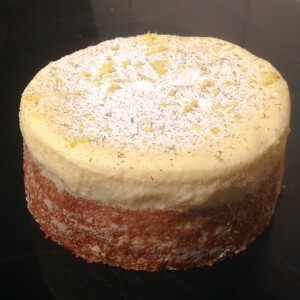 The outcome was a beautiful light and soft lavender cake topped with a smooth and fluffy white chocolate based Limoncello mousse. 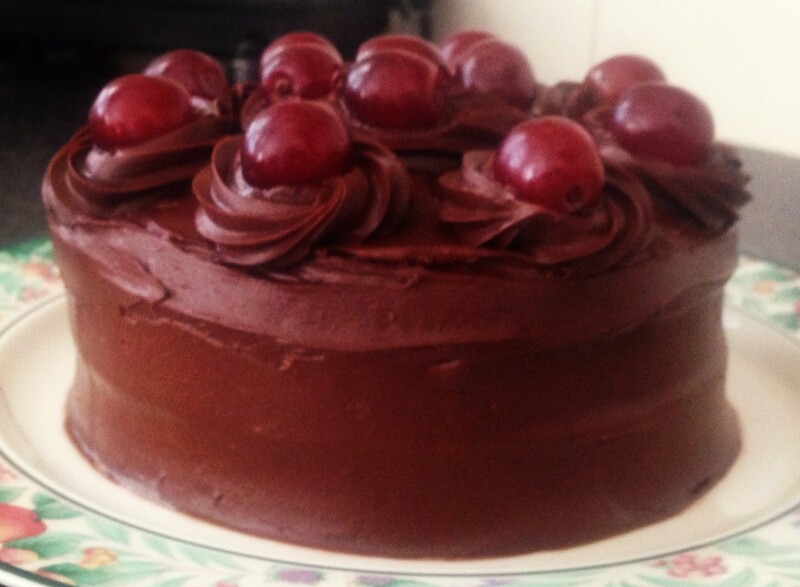 A moreish and exquisite cake outcome. 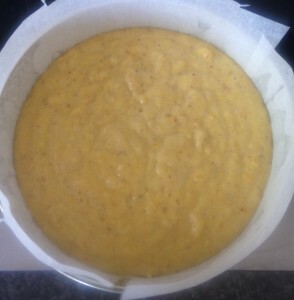 Pre-heat the oven to 175c degrees and line a 25cm spring form cake tin with baking paper. Place the lavender into a mortar and pestle and ground into a powder texture. Place the flour, powder, soda, salt and ground lavender into a bowl and stir until combine, set aside. With electric beaters whisk the eggs and sugar until thick and creamy. Add the oil in a steady stream, then the limoncello then buttermilk until well combined. Add the flour mix and beat until just combine. Pour into the cake tin and bake in the oven for 35 minutes or until a skewer inserted in the center comes out clean. Turn the cake out of the tin onto a cooling rack. Meanwhile make the mousse by placing 200ml of the cream in a saucepan with the white chocolate and stir on a low heat until the mix is creamy and smooth. Set aside to cool completely. Place the remaining 270ml of cream into a bowl with the icing sugar and using electric beaters whisk on high until peaks form. Add the limoncello and lemon zest to the cream mix and beat on low until combine. Place the water and gelatin into a bowl and stir until combine then heat in the microwave until warm and the mix is smooth. 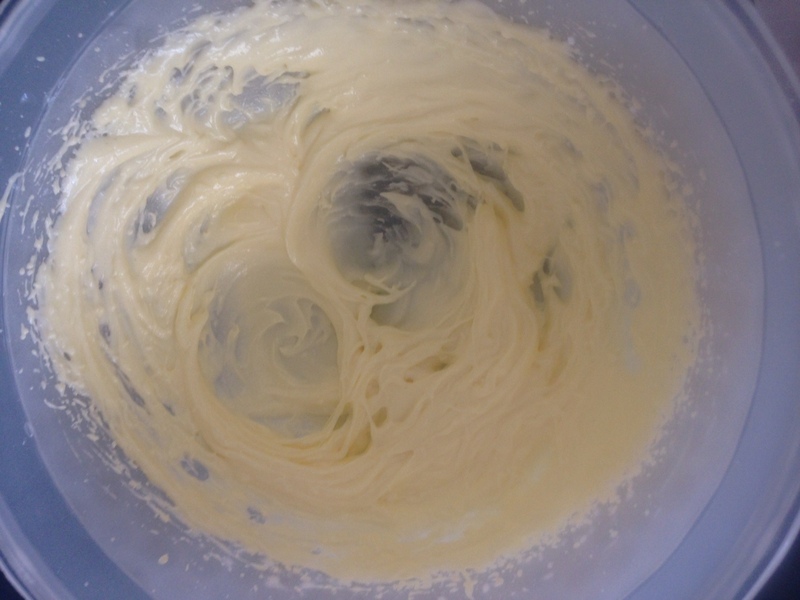 Add the gelatin mix to the cream mix and whisk with the electric beaters on low for 5 seconds or until combine. 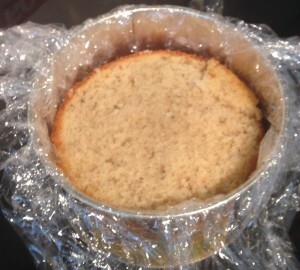 Place 2 pieces of plastic wrap over the cake tin and place the cooled cake into the tin. 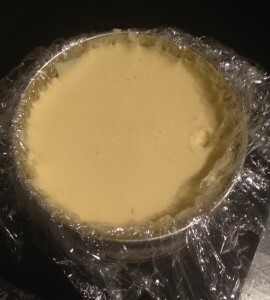 Pull the overhanging plastic wrap to the sides of the tin. 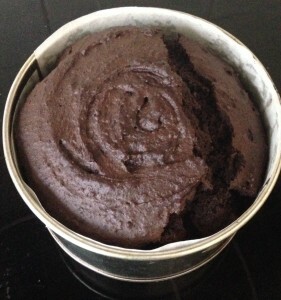 Pour the mousse mix over the top of the cake and place the tin in the freezer for 4 hours to completely set. To serve the cake pull the plastic wrap on the sides until the cake comes out clean. Place the cake on a plate with the mousse on the top and durst with icing sugar and in desired some additional lemon zest and ground lavender. Tags: cake, lavender, Lavender and Limoncello Mousse Cake, limeoncello mousse, mousse	. Posted on November 23, 2015 Posted in Cakes	. The idea for this cake actually came from a desire to make a cake that heroes the orange in its entirety. 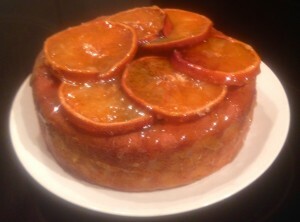 I wanted to make a cake that yelled orange flavor while also using the whole orange – skin and all. Now using the whole orange is not a new thing but seems to get forgotten often and has such beneficial properties to it. The orange blossom provides a lovely floral ascent to the orange fruit and the polenta and yoghurt work with the cakes core texture . I also used gluten free flour to make this qluten free friendly. Place the oranges into a large pot on the stove and fill with water until the oranges are covered. 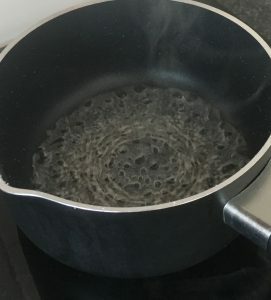 Turn the heat to high until the water is boiling then down to a gentle simmer. 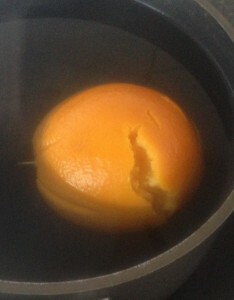 Place the lid on the pot and leave to simmer for 45 minutes or until the oranges are soft (a knife should glide easily through the skin). 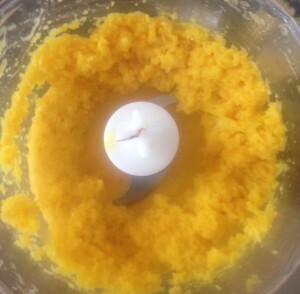 Place 2 oranges that have not bursted aside and place the remaining 3 oranges into a food processor until smooth. Spoon mix into a bowl and leave aside to cool. 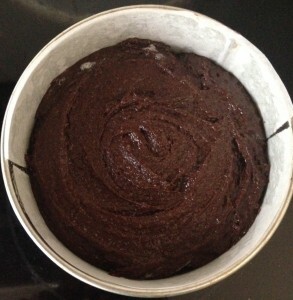 Pre-heat the oven to 180c degrees and line a cake tin with baking paper. Meanwhile place the butter at room temperature in a bowl with the sugar and with electric beaters whisk until light and fluffy. Add the honey and orange blossom water and beat until well combined. Add the flour, baking powder and beat until combine. Add the almond meal, polenta and eggs and beat until well combined. Lastly, add the cooled orange puree and the yoghurt and stir until well mixed. Cut the 2 oranges once cooled into thin slices and spread out on baking paper on a baking tray. Sprinkle the extra brown sugar on the flesh of the orange and place in the oven on the bottom shelf. 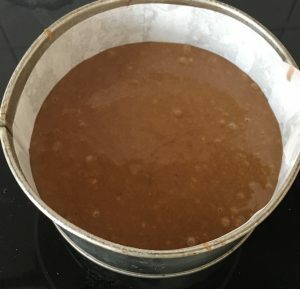 Pour the cake batter into the prepared cake tin and place in the oven on the top shelf for 1 hour or until a skewer inserted into the cake only just comes out clean. 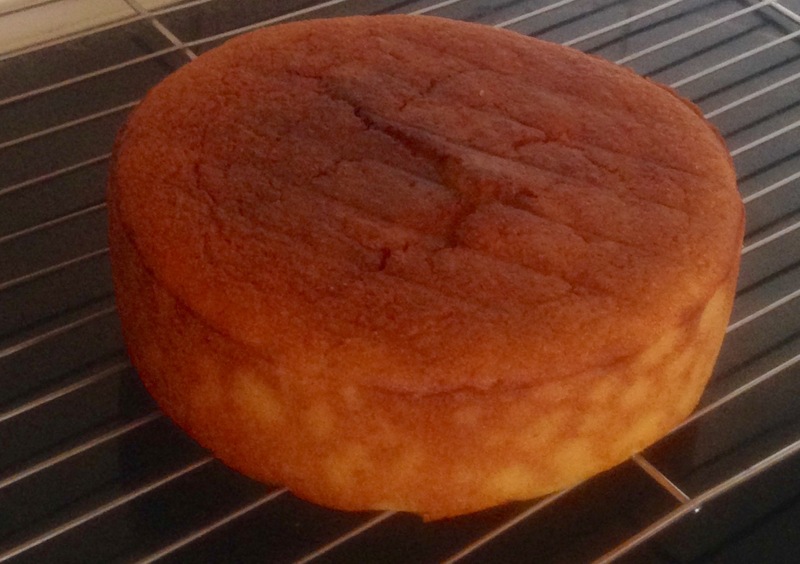 Leave the cake aside for 15 minutes then invert onto a cooling rack. Remove the orange slices from the oven, you will know they are ready when they are almost dried before they brown. Place the slices on top of the cake. To finish the cake place the syrup ingredients into a saucepan on a simmering heat until the syrup thickens. Pour the syrup over the cake and enjoy. 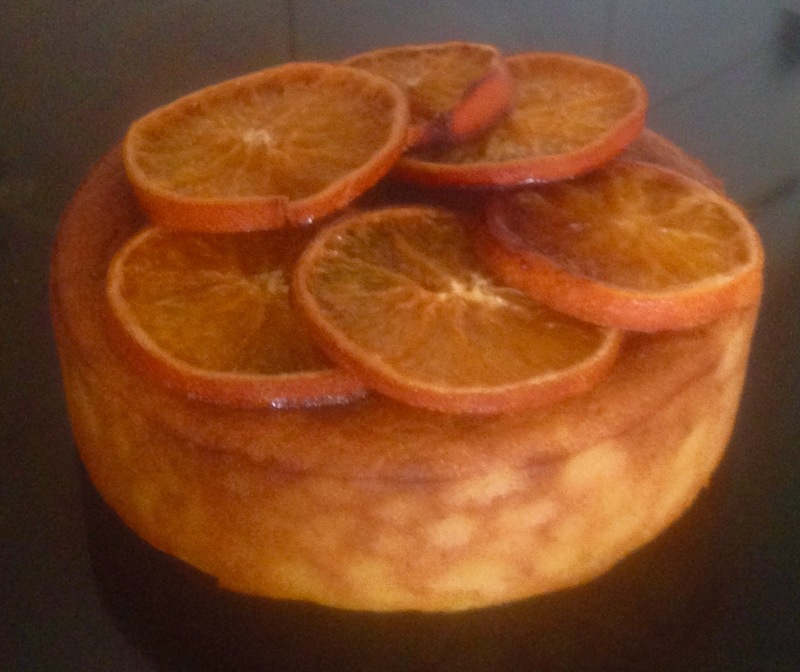 Tags: cake, orange, orange blossom, Orange Blossom Polenta and Yoghurt Syrup Cake, polenta, syrup, yoghurt	. 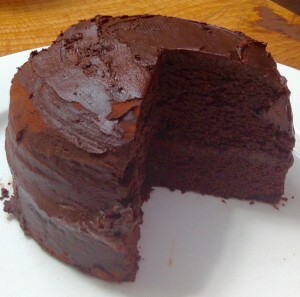 My last post featured the Chocolate Zucchini cake, which I would say was one of the most dense cakes I have ever made, however this cake I am about to introduce you to would be one of a few that is an exception. Recently I have been drinking red wine a lot more than I usually do (I’m not really a wine or beer drinker, more a spirit with mixers). 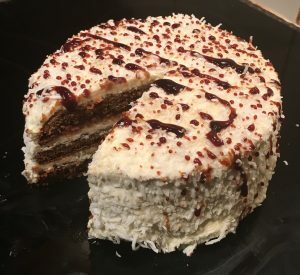 Based on this new palate I seem to have I thought it could be fun to experiment with red wine in a cake (many cakes have liqueur’s so this isn’t that different..is it)? Preheat oven to 180c and line a 25cm spring form cake tin with baking paper. Add all the dry ingredients into a bowl via a sieve and stir to combine. 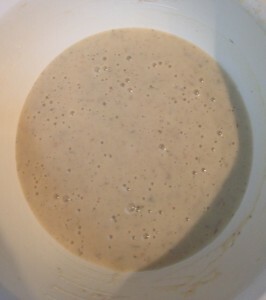 Then add all the wet ingredients and beat with an electric beater on medium for 2 minutes until the batter is smooth. Pour batter into the cake tin and bake for 40 minutes or until the skewer comes out clean. Cool the cake for 5 minutes in the tin then transfer to a wire cooling rack. This cake is awesome and the red wine is not over powering at all. If you want to make cupcakes instead pour batter into cupcake patties and cook for 15 minutes. 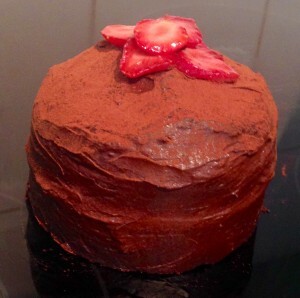 I decorated my cake with chocolate cream cheese frosting that had red wine also incorporated into it. Like this recipe? 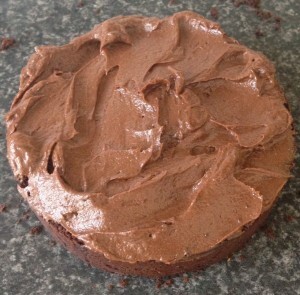 I recommend you also check out my Chocolate Zucchini Cake. Additionally please do subscribe via RSS or email to get my new entries and more scrumptious recipes with reviews. Tags: cake, chocolate, cream cheese, cupcakes, red wine	.